Situated In the south of France, Hérault, Languedoc invites you to experience unique and remarkable sites which have been shaped by both man and nature. Near to the Mediterranean Sea, in the mountains, towns and vineyards, a great variety of attractions await the visiter... Discover them now! 25 km away, in the heart of the Languedoc and the Gorges de l'Hérault, the "Grand Site of France Saint-Guilhem-le-Desert - Gorges de l'Hérault" is one of the jewels of Languedoc. It is rightly one of the Most Beautiful Villages of France. 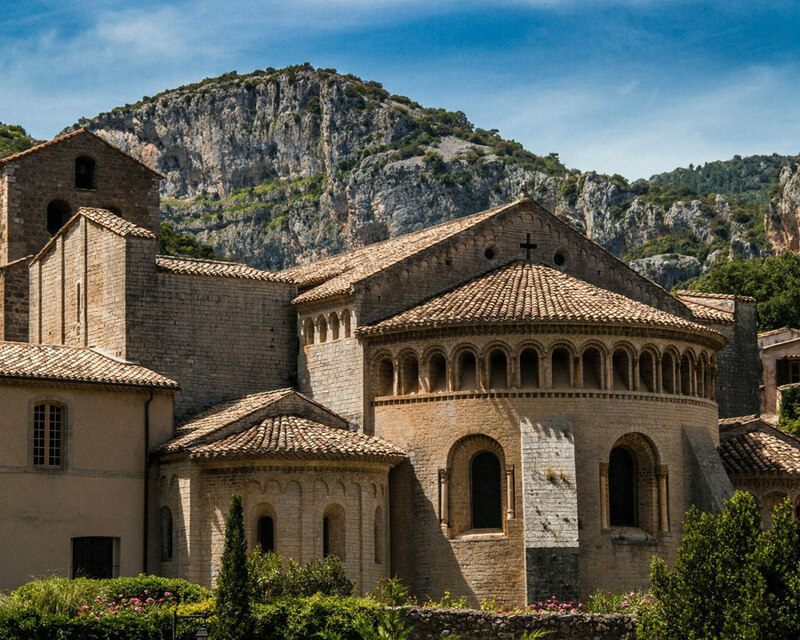 Situated between vertiginous cliffs, stretching along winding pathways, Saint-Guilhem-le-Désert grew up around Gellone Abbey, a few kilometers from the Pont du Diable, both of which are UNESCO sites grouped under the classification "Roads to Santiago de Compostela ". The mountains of Saint-Guilhem and the Pont du Diable are popular with walkers as they discover magnificent panoramas as well as rare botanical species. An unmissable attraction and only 25km away, Clamouse is one of the most beautiful cave systems in the Lower Languedoc region. 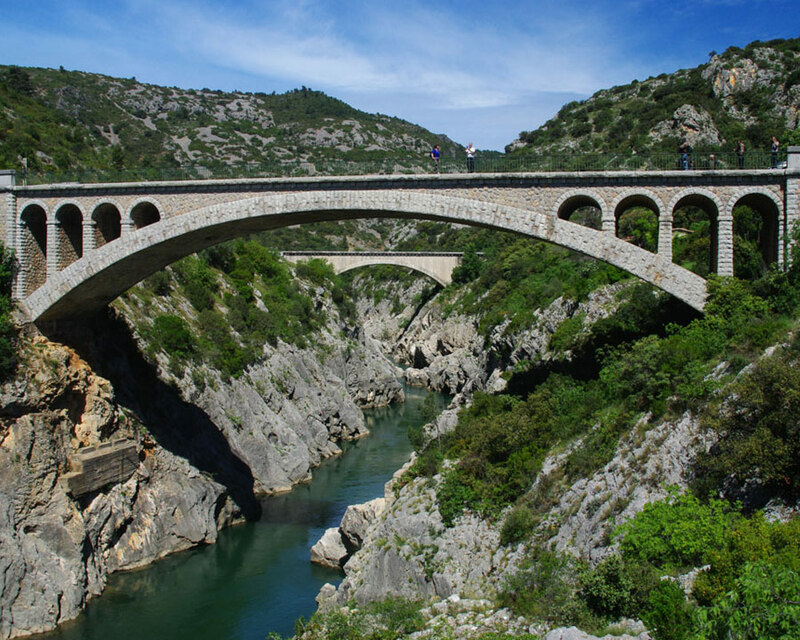 It is located between the Pont du Diable and the Grand Site of France, "Saint-Guilhem-le-Desert - Gorges de l'Hérault". Discovered in 1945 and listed as a "scientific and picturesque site" by the French ministry of ecology, the diversity of its calcite and aragonite concretions makes this a truly outstanding site. It is also distinguished in that it boasts three Michelin stars. Its series of galleries are particularly interesting for the behavior of the underground waterways that surge through here during floods, constantly adding to its beauty. Its fine, fistulous and eccentric crystallizations create a fairy tale setting with their extraordinary shapes. This "Cathedral of Time" is further enhanced by a sound and light show. 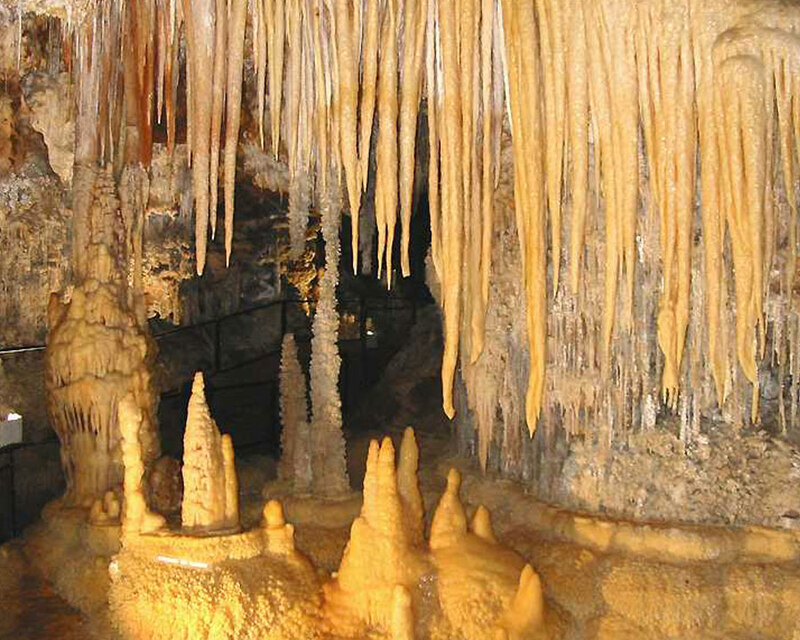 Situated In Languedoc, at Saint Bauzille de Putois, bordering the Hautes-Garrigues and the Cévennes in the south, the Grotte des Demoiselles is a striking sight. In the depths of Thaurac plateau, discover a real underground cathedral. Also called "the cave of the fairies". This name refers to the Occitan legends. The fairies are also called "Demoiselles". 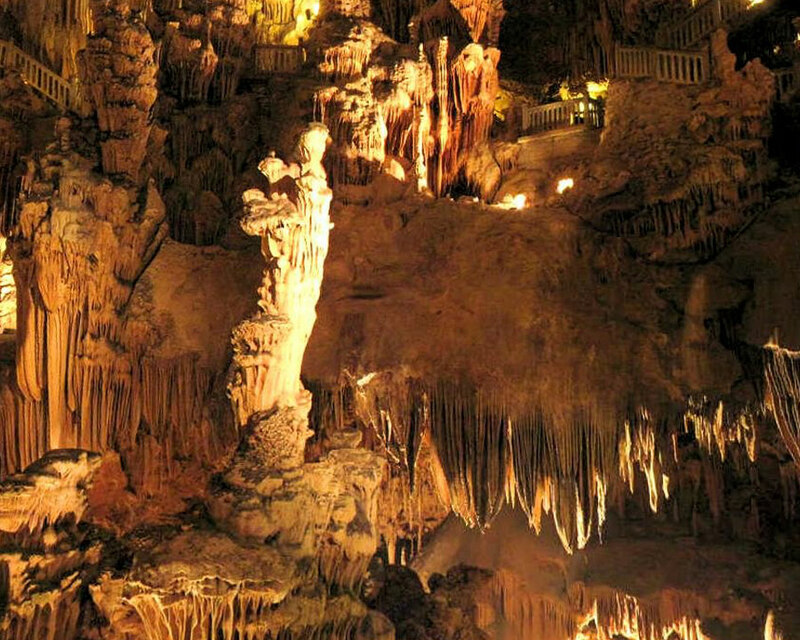 Discover impressive natural architecture: giant draperies, pillars, stalagmites and imposing stalactites. The large room called "cathedral" contains an immense concretion reminiscent of a statue of the virgin and child. Its proportions are spectacular: 120 m long, 80 m wide and 50 m high. Its surprising acoustics makes it possible to host concerts. Here is the original performance hall ! 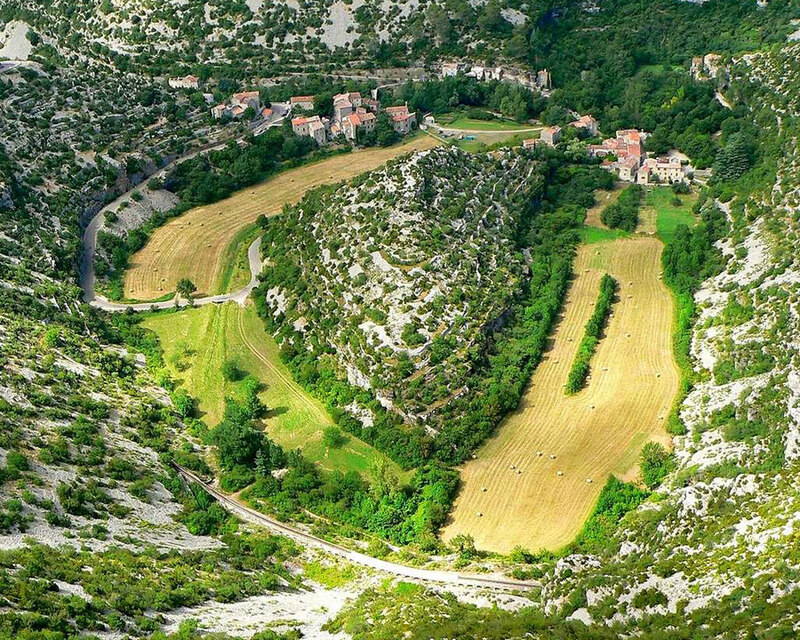 At the heart of the Causses and Cévennes area, a classified UNESCO World Heritage site, the ‘Grand Site du Cirque de Navacelles’ was formed long ago when a meander of the river Vis carved it into the limestone of the Causse plateau. Today, the river has dried up, leaving a wonderful spectacle of nature. North of the Department of Hérault, on the border with the Gard, the river Vis dug its bed deep into the limestone of the causses (Blandas and Larzac) forming large meanders. Over time, erosion of the rock allowed the river to divert to the shortest route, thus abandoning its old bed. So was born the Cirque de Navacelles. To explore the site properly, you must go right down to the bottom of the 300m deep cirque, or circus. At the bottom, amidst an oasis of greenery beside the Vis waterfall, you'll find the village of Navacelles. There is also a nature trail, easily accessible to all. Today, the Cirque de Navacelles has the 'Grands Sites de France' label, and is proud to welcome more than 250,000 visitors each year. Since 2011, the Causse & Cévennes area surrounding the Cirque has been a classified a UNESCO World Heritage site. An original idea for a cultural visit with family or friends. Just 10km from Béziers, this archaeological site is an outstanding example of a prehistoric village. Built on a rocky headland, it offers a 360° view of the wine-growing plains and the astonishing Etang de Montady. A Mecca of Mediterranean civilization,this oppidum is typical of dwelling places in southern Gaul from the Bronze Age until the Roman conquest. It was inhabited continuously throughout this period. On the site, the museum has most of the archaeological finds on show including an excellent collection of Gaulish ceramics and weapons. 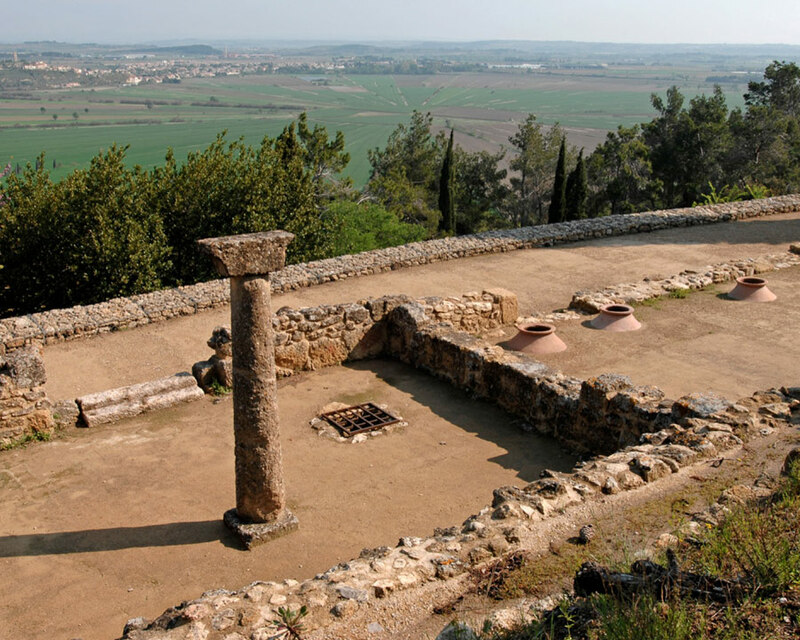 Occupying a strategic location: In the south-west of the Hérault, the oppidum is located on a steep hillside, at the crossroads of many important land and sea routes. Down below, the Roman Via Domitia used to connect Rome with Spain. Today, the oppidum dominates the plains of Béziers and its famous vineyards. The view here is truly amazing, owing chiefly to the Etang de Montady, a drained wetland situated on the plain and just a few hundred meters from the oppidum. It is a real curiosity in itself, with fields that have radiated out from a central point like the rays of the sun since the ditches were first dug to drain the land in the 13th century. And the Oppidum d'Ensérune offers the very best view. Running under the hillside, the Canal du Midi takes the 170 meter long Malpas Tunnel, bored in 1679. This is the first tunnel in the world to have been dug specifically for a canal. The magic of a site, built in the reign of Louis XIV, by the genius designer Pierre Paul Riquet, linking the Atlantic to the Mediterranean for commercial purposes. Initiated in the South of France, in the 17th century, this project united technical innovation with an increased awareness of architecture and landscape in a way that had rarely been seen elsewhere. .All of this was possible thanks to the determination, of one ingenious man, Pierre Paul Riquet, who figured out how to solve one major problem; how to find a permanent water supply for the canal In the Black Mountain, near Castelnaudary, he pinpointed the watershed between the Atlantic and Mediterranean drainage basins, and then he then diverted the water from surrounding streams and stored it in Saint-Féréol lake. The last stage was to carry the water to the Seuil de Naurouze, where the waters divide between the east and the west, thus feeding the two arms of the Canal du Midi, one running towards Toulouse and the other towards the Hérault area and Marseillan. From Marseillan to Capestang, discover remarkable architecture. Today, it is a great leisure highway for cyclists, walkers and boat enthusiasts. It is also a leisure route : In 1980, the Canal du Midi stopped being used for goods transport. Classified a UNESCO World Heritage site in 1996, today the canal is used purely for pleasure. You can enjoy it from a leisure boat, or travel the towpaths on foot, on horseback or by bike. 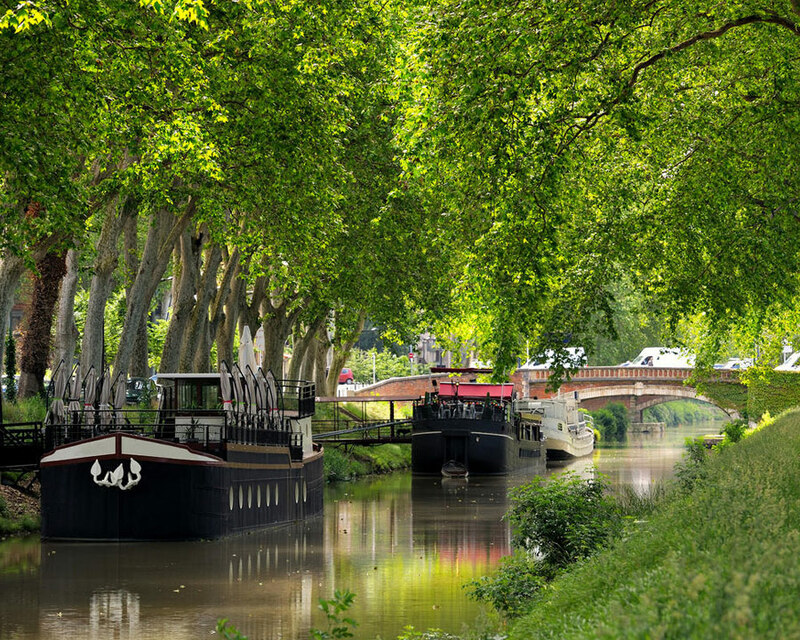 The Canal du Midi is one of the loveliest ways to visit Béziers and its surroundings, with its Mediterranean character marked by a rich wine-making past, bullfighting and rugby!